We look forward to welcoming you at one of our upcoming presentations or seminars. To view an introductory webinar and learn more about our practice, click here. *Please note, all events below are for 18 years or older guests. RSVP is required. Come to our next FREE dinner presentation (includes free meal & informational health presentation) and learn how to change your health for the better. 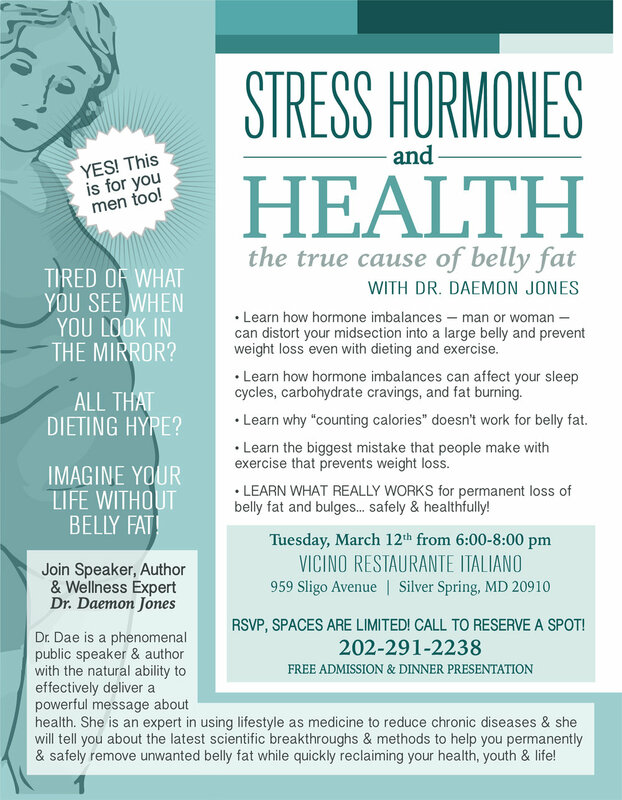 Join us on Tuesday, March 12th at Vicino Restaurante Italiano, 959 Sligo Ave, Silver Spring, MD 20910 at 6:00 pm, sharp. Free public parking is available behind the restaurant. Join us Tuesday, March 5th, at Vicino Restaurante Italiano, 959 Sligo Ave, Silver Spring, MD 20910 at 6:00 pm, sharp. Free public parking is available behind the restaurant. Join us Tuesday, February 26th, at Vicino Restaurante Italiano, 959 Sligo Ave, Silver Spring, MD 20910 at 6:00 pm, sharp. Free public parking is available behind the restaurant. The FREE dinner presentation will be held Tuesday December 4th at Vicino Restaurante Italiano, 959 Sligo Ave, Silver Spring, MD 20910 at 6:00pm, sharp. Struggling to get quality sleep? The FREE dinner presentation will be held Wednesday, September 26th at Vicino Restaurante Italiano, 959 Sligo Ave, Silver Spring, MD 20910 at 6:30pm, sharp. Space is limited so RSVP by calling 202-552-0860. Free public parking is available behind the restaurant. The FREE dinner presentation will be held Thursday, September 20th at Vicino Restaurante Italiano, 959 Sligo Ave, Silver Spring, MD 20910 at 6:30pm, sharp. The FREE dinner presentation will be held Wednesday, September 12th at Vicino Restaurante Italiano, 959 Sligo Ave, Silver Spring, MD 20910 at 6:30pm, sharp. The FREE dinner presentation will be held Wednesday, August 29th at Vicino Restaurante Italiano, 959 Sligo Ave, Silver Spring, MD 20910 at 7:00pm, sharp. 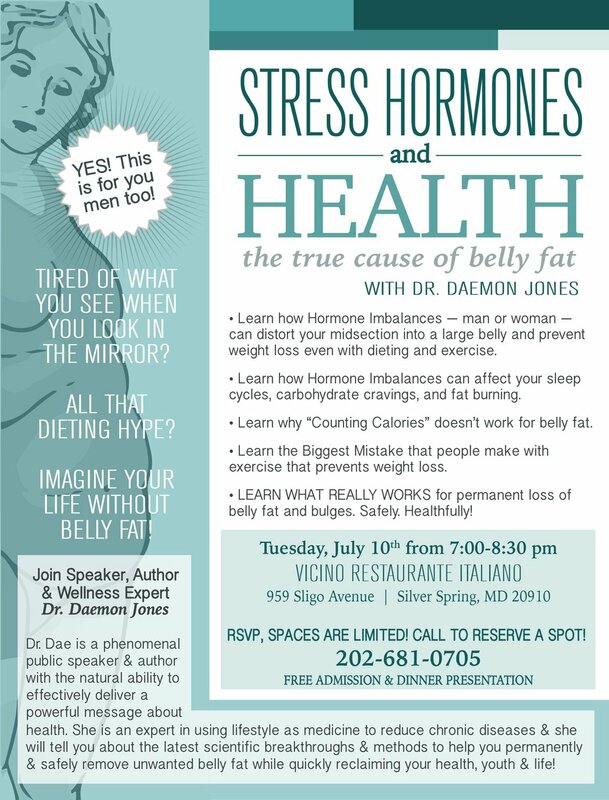 The FREE dinner presentation will be held Wednesday, July 18th at Vicino Restaurante Italiano, 959 Sligo Ave, Silver Spring, MD 20910 at 7:00pm, sharp. It has been hot outside and if you are like many of us, your thoughts are focused on your warmer weather wardrobe. Summer is just around the corner! Are you eager to make a change and get the summer body you've always hoped for? 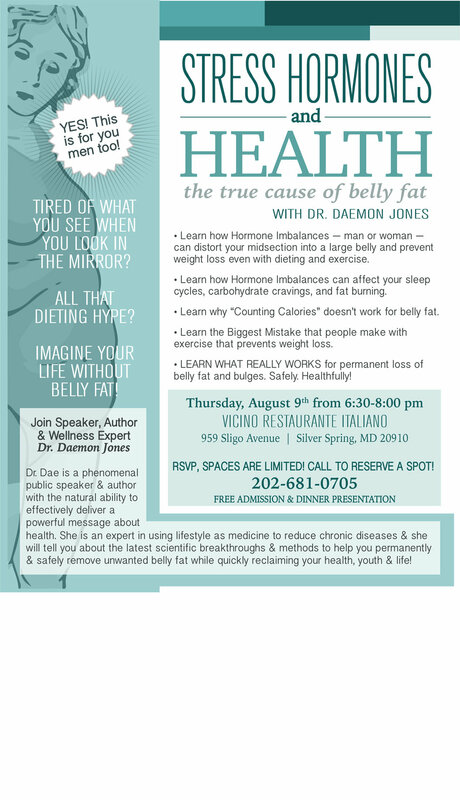 Then you want to come to tomorrow's Stress Hormones and Health dinner presentation, to learn about how to get rid of the pesky weight that won’t budge. If you are worried about the hot weather making your hot flashes worse, then you need to come to this seminar too because it will be game changer for you this summer season. 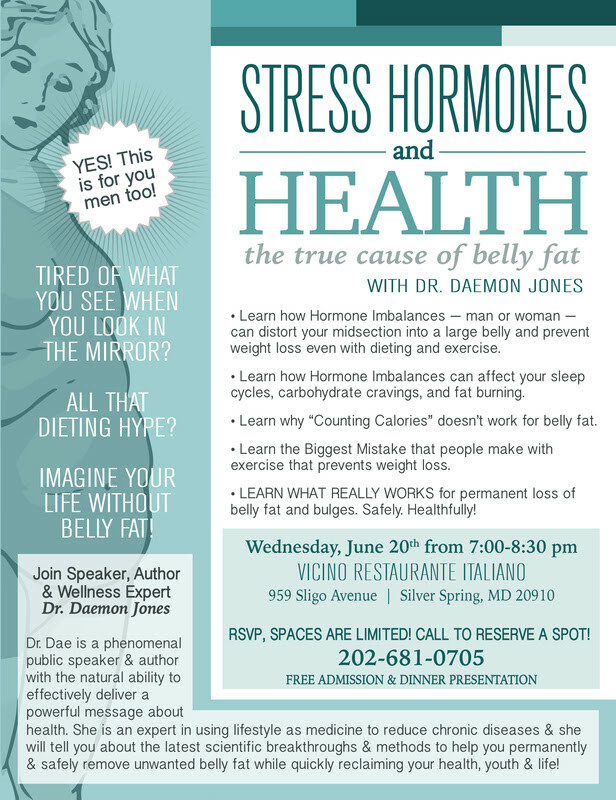 The FREE dinner presentation will be held this Wednesday, June 6th at Vicino Restaurante Italiano, 959 Sligo Ave, Silver Spring, MD 20910 at 7:00pm, sharp. Space is limited so RSVP by calling 202-798-2426. Free public parking is available behind the restaurant. Questions? Contact Dr. Dae at 202-681-0705 for more information or to get started in our practice!